Orion is scared of a lot of things. The world is full of scary, you see, but the most scary thing of all, according to Orion, is ... the DARK. Orion has tried all kinds of things to solve his fear of the dark, but but not much has worked. But then one day, Orion becomes so frightened, he gets totally fed up and calls out to the Dark and tells it to GO AWAY! That's when something amazing happens. The Dark comes to say hello ... and tell Orion he needs to stop being so afraid of things. 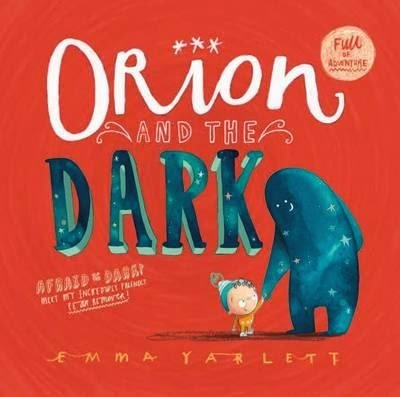 They shake hands (thanks to a fabulous die-cut hand popping from the gutter of the book) and Dark takes the boy on an adventure, exploring dark and scary places until Orion realises they aren't so scary any more. This is a stunningly-produced book about facing our fears, yes, but it's also about the the warmth of friendship. Author/illustrator Emma Yarlett has created a truly gorgeous story of luscious illustration, layout, design and typography (she is also a talented typographer) that will have design aficionados peeping with glee, and kids entranced. Don't miss it. Fans of Oliver Jeffers will love this.